This set will hold 100's, and comes with three of each Ace of Suit from a deck of playing cards. 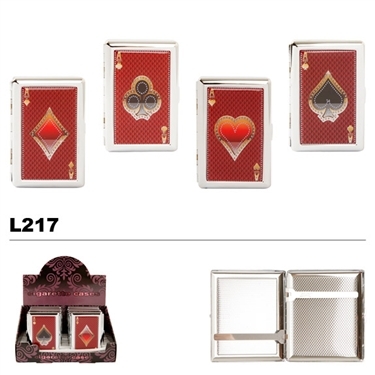 This set also has a matching set of steel lighters! Cases for cigarettes are hard cases with spring hinges, and interior spring loaded arms. Sold by the dozen and packaged in display boxes. We carry cases for cigarettes that will fit filter cigarettes and also cases that will fit 100's.